The second Grizzly Bear photo workshop of 2016 was treated to lots of bears clamming and sow/cub play. We had a great group from all over the US that was keen to spend time out with the bears, even when raining. 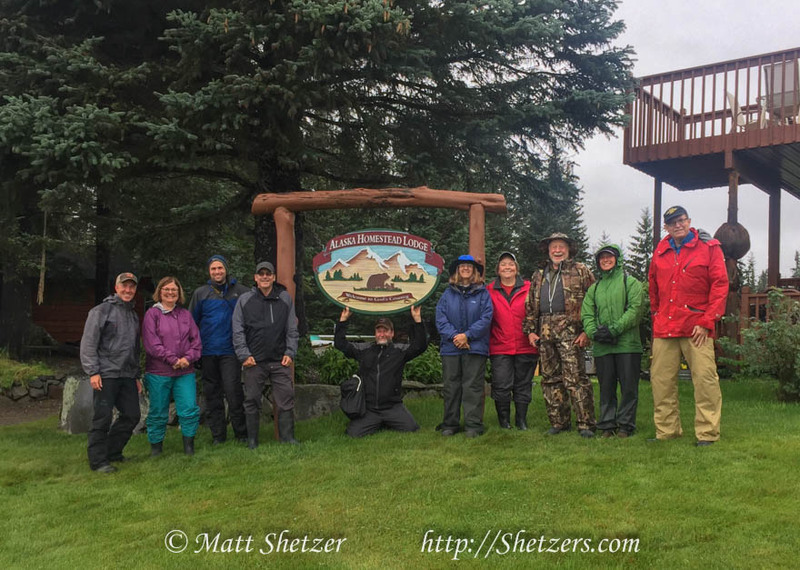 Matt, Eileen, Rob, Steve, Brian, Nancy, Celeste, Chuck, Bell and Ed out front the beautiful Homestead Lodge at Silver Salmon Creek in the Lake Clark National Park and Preserve. The trip started off with dinner in Anchorage to discuss the upcoming days and make sure everyone is prepared so we can get out photographing the bears as soon as possible. 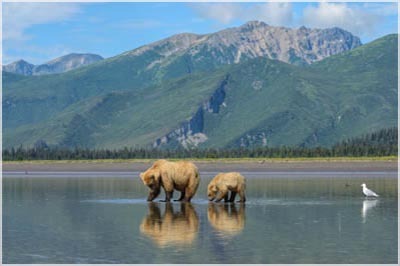 An early night to bed, and we head to Lake Clark National Park and Preserve in the morning. After breakfast the group heads over to the chartered Cessna 206’s. We had a weather delay as there was a lot of fog between Anchorage and Silver Salmon creek. We had to wait for the weather to clear and arrived on the beach before lunch. We headed to the lodge for lunch, our safety meeting, and got dressed to go out into the field and photograph the bears. Right away we found a Sow with her two spring cubs (this year’s cubs). She brought her cubs right up to us to welcome the group to the area. We then found her in the grassy meadow, and she rolled over and nursed her cubs right in front of us. As the evening came, we headed back for dinner and enjoyed lemon crusted salmon caught the day before, and fresh greens from the lodges garden. Chuck taking a moment to watch the beautiful bears up close. The rain picked up, and we decided to stay inside and discuss different photography techniques for capturing images of the bears. We woke to a little more rain and headed out at 6am. As the tide dropped, the bears started showing up to clam. This is a great behavior to watch and photograph. Each bears technique is a little different, but basically they walk around the tidal flats and as they smell the clams beneath the sand, they will dig up the clam, open the shell and eat it. The cubs are always entertaining to watch as they don’t quite have it down and dig lots of holes without clams. We photographed a sow and two yearling cubs (two year cubs) as well as a sow and two spring cubs clamming. A plane landed on the beach and a boat was high and dry on the low tide so we just added these props to our compositions. We also photographed two juvenile bears as well as a long session with a beautiful sow and her three spring cubs playing, nursing and play fighting. As we headed back to the lodge, a sow and her two cubs were at the lodge’s backyard playing and nursing. After dinner we headed back out for more clamming behavior. Just watching the bears out in the tidal flats close up is so interesting. We stayed with a sow and her two yearling cubs for a couple of hours, as well as two juveniles bears as they clammed, ran and played. We also photographed some nice landscape shots with some snowcapped mountains in the background, as well as some nice bear tracks leading down the beach. As we headed out in the morning, we found some beautiful spider webs with the heavy dew, we then photographed the spider webs with a spider right in the middle of the web and the dew drops. We then found a nice Bald Eagle in an evergreen tree. Worked on different techniques to get sharp images of the eagle and different compositions. The eagle was very patient with us and let us take our time making sure everyone got a great image. As we approached the Cook Inlet we saw the bears clamming and created some moody silhouette images. The sow with her two playful spring cubs quite a show on for us. They all played together and wrestled. These behaviors and a good mother will help the cubs succeed in life with lots of practice of fighting skills. We then photographed the sow with two yearling cubs clamming for a couple of hours. The light was very nice on her, and we were able to line up the mountains in the background for that great Alaskan bear image. As tide began to come in, we had to leave the beach, and found a Sow with three spring cubs in the meadow. Cubs played and wrestled right in front of us providing us with the opportunities for great images. After dinner we searched for the bears, however it was very quiet. After all the action today, they deserved a little piece and quiet. We did find a large porcupine, and watched it climb up a tree without any effort. As the evening went on, we photographed a sow and her three spring cubs heading to the beach. They came very close to us, within 15 feet, and just walked right on by. We got to enjoy the cubs running around just as kids do. We woke to rain, and lots of it. We decided to postpone going out until the weather broke a bit. After breakfast we headed out to watch more clamming behavior. Four juvenile bears were all clamming, and were playing fighting. After the young bears left, a sow with her three spring cubs then started clamming. We photographed her as she and her young cubs played with each other rough-housing which will help prepare her young cubs with the skills needed for life. We headed back to the lodge to dry off and enjoy a nice lunch. After lunch we continued to photograph the bears on the beach. We photographed a sow and her two spring cubs and watched the cubs play and interact with their mother. Then, a sow with three springs came to the mouth of the creeks for a little fishing. She didn’t catch anything, but it was fun to watch her running all around chasing the fish. Today we had another low tide, and were able to photograph a sow clamming with her two yearling cubs. A young bear was hanging around making all bears uneasy, creating great photographic opportunities as they would stand looking at each other and the cubs would tuck close to mom. We then photographed a beautiful sow with her two spring cubs in the green meadows of Silver Salmon creek. When we got back to the lodge, a sow was visiting the backyard and had laid down in the grass posing with red flowers in the background. Later that day, we had a great shot with a young brown bear in the purple fireweed. As the bear stood up on in hind legs, it gave a great stretch, and opened its mouth providing a favorite image for all the guests. On the last day, we woke to heavy rains and the group opted to stay in and review their images from the week. We headed over to the game room to discuss a detailed image review for the group and everyone brought great images to discuss. We discussed all the camera settings on each image, compositional techniques and post processing ideas. The whole group joined in on their views of everyone’s image, provide great feedback. When a group contributes to everyone’s images, discussions are so beneficial to everyone. As the rains continued, the planes were grounded, thus delaying our return out of Lake Clark. Some of the group opted for a boat transfer back to the mainland, and others were able to fly out the next day. If you are going to be weathered in, this is a great place to be.